Tally and Grace are teenage sisters living on the outskirts of society, dragged from one no-hope town to the next by their fugitive father. When an explosion rips their lives apart, they flee separately to the city. The girls had always imagined that beyond the remote regions lay another, brighter world- glamorous, promising, full of luck. But as each soon discovers, if you arrive there broke, homeless and alone, the city is a dangerous place - a place where commerce and surveillance rule, and undocumented people like themselves are confined to life’s shady margins. Now Tally and Grace must struggle to find each other - or just to survive. 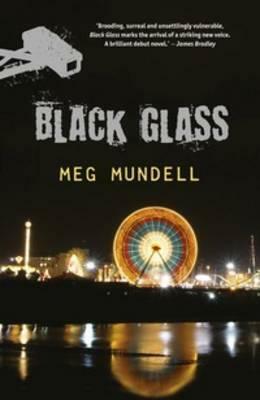 Narrated by a cast of unforgettable characters, Black Glass is the work of an exceptional new talent. It’s Melbourne, but not quite as we know it, that’s the setting for this impressive debut from former journo, ex-ventriloquist’s assistant, current academic Meg Mundell. We’re not sure of the year in which Black Glass is set, though Mundell parcels out hints throughout. Enough time has elapsed since the present-day for Barack Obama to be referenced as ‘That old president guy’; inner Melbourne has been hollowed by economic collapse; a clandestine whiz controls public temperament through the deft modulation of light, sound and scent in contained spaces; and citizens who wish to live above the line submit their particulars to the National Documentation and Identity Database, while everyone else is left to roam the outlaying Regions as neglected ‘undocs’. It’s a bleak, recognisable vision of a possible tomorrow and Mundell colours it with imagination and intelligence. The proliferation of corporate influence and state-sanctioned surveillance – and the ways people work to evade these all-seeing eyes – is key to Black Glass. Along with Milk, the aforementioned ‘moodie’, we follow undoc sisters Tally and Grace, who find themselves separated after an accident and eking out very different existences within city limits. There’s also Damon Spark, investigative reporter, as well as a host of memorable supporting characters, all of whom operate, to varying extents, in the shadows or at society’s fringe. Accordingly, Mundell lets her story unfold via various viewpoints and styles: notebook entries, transcribed conversations, descriptions of CCTV footage, typical third-person prose, etc. It gives the book the apposite paranoid feel of a dossier or official report, without ever calling too much attention to the stylistic device. With public malaise more rampant than ever, it’s heartening to find a young, local author engaging with some socio-political concerns that will only mount in both urgency and importance in the years and decades ahead. Its final act might barrel too quickly towards its conclusion, but that can’t detract from the fact that Black Glass is made of stimulating, satisfying stuff. Gerard Elson is from Readings St Kilda. Only Ever Always is a beautifully crafted and emotionally intense novel that teases out the intriguing idea of the line between self and the material world. Millions of tiny robots dismantle Atlantic City. A Luddite encounters time travelers near the moment of Singularity. A young boy may have just destroyed the entire Eastern Seaboard.